Product prices and availability are accurate as of 2019-04-25 10:56:20 UTC and are subject to change. Any price and availability information displayed on http://www.amazon.com/ at the time of purchase will apply to the purchase of this product. 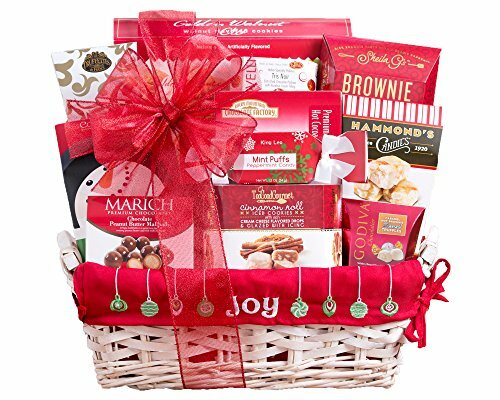 Joy to the World Holiday Gift Basket Send your recipients a joyful surprise this season with this beautiful ensemble. A classic basket with a red liner that says "Joy" is filled with butterscotch candy, Ghirardelli chocolate squares, chocolate caramels, Godiva milk chocolate caramels, hot cocoa, King Leo mint puffs, Lily O'Brien's dark chocolate truffles, chocolate peanut butter maltballs, brownies cookies, candy cane popcorn, white peppermint candy and Rocky Mountain Chocolate Factory English toffee to help make spirits bright. Gift Size: 16" x 8" x 10" Catalog Item 351 Butterscotch Hard Candies (3oz) Ghirardelli Mini Dark Chocolate with Mint Square (1pc) Godiva Milk Chocolate Caramels (2pc) Hammond's Hot Cocoa Mix (0.85oz) Lily O'Brien's Dark Chocolate Truffles (2pc) Marich Chocolate Peanut Butter Maltballs (1.5oz) Monica's Brownie Cookies (3oz) Candy Cane Popcorn with King Leo Peppermint (6oz) Rocky Mountain Chocolate Factory English Toffee (2pc) Chocolate Caramels (5pc) Ghirardelli Mini Peppermint Bark Square (1pc) There's a special kind of magic that happens when everything comes together. From the delicious food and the amazing wine, to the cloudless sky and the boundless conversation. It's the kind of magic nobody can stop talking about. The kind they'll still be talking about months later. Wine country is more than just a location. It's a state of mind. The wine and fruit are fresh off the vine, the scenery is lush and serene, and everyone is laid back and enjoying the bliss of the moment. Every day feels like one worth celebrating, and we believe that the wine country state of mind is something that can be tied with a bow and delivered to your door.